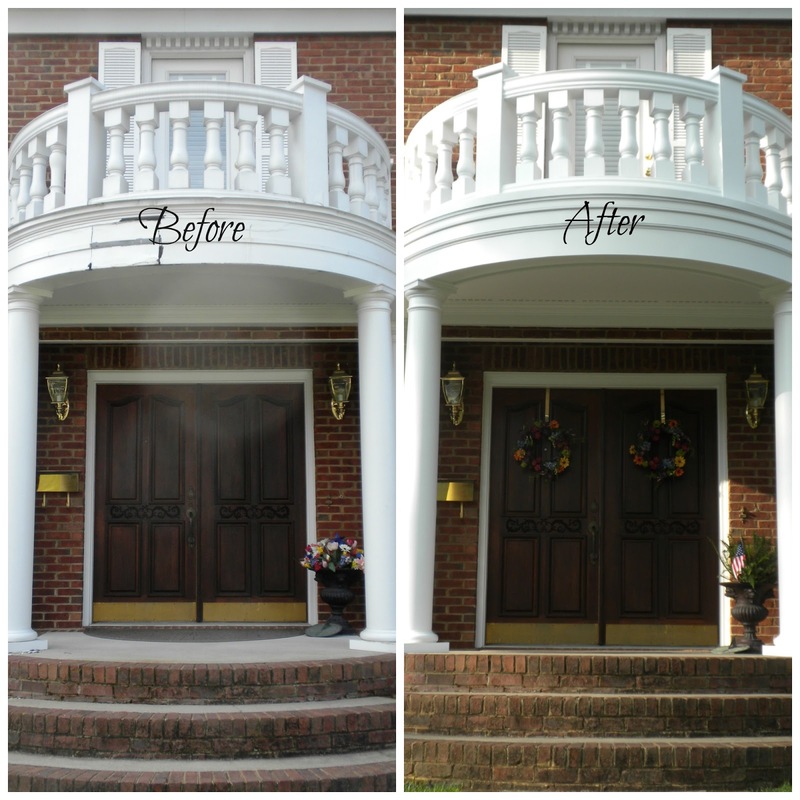 Without further ado, I am more than happy to report that my porch balcony facelift is complete! In my post over a month ago, I shared all the issues we had with our balcony since its initial construction in 2004. 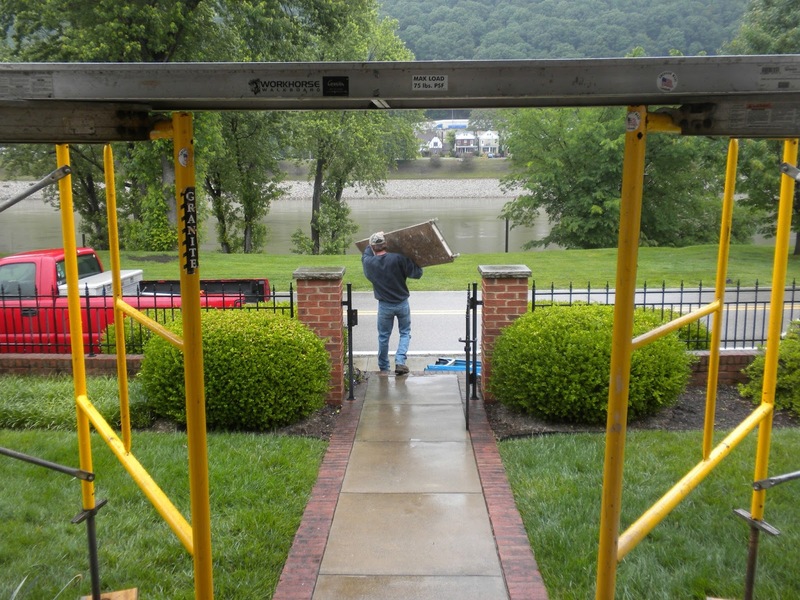 I am happy to say that we not only succeeded in sourcing an excellent carpenter / craftsman, but we also succeeded in finally getting what appears to be a long-term fix to the water issues we had with our original design. When you look at before and after photos, you may not notice a huge difference, but believe me when I say it is a huge difference already. Since the balcony was sealed in this redo, we have had well over 7" of rain, and no issues to report. Issues were apparent immediately after the first rain in the 2004 construction. Just for fun, though, let's take a quick look at the before and after of our project. 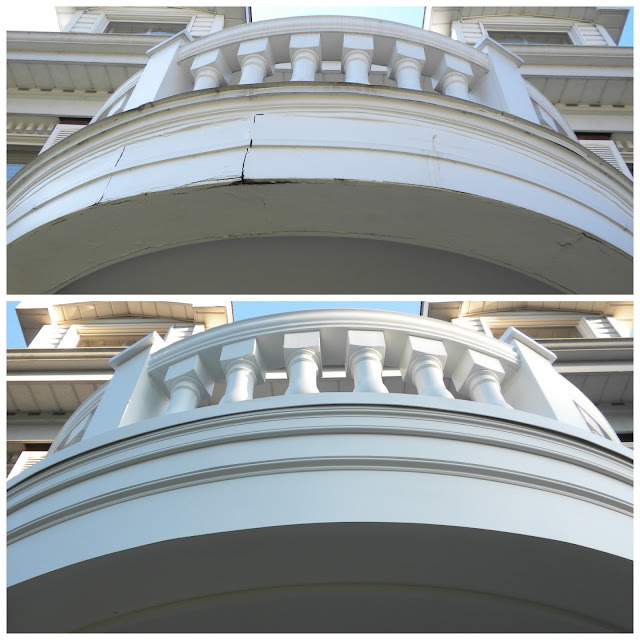 The most obvious of the issues were visible when looking up at the outer edge, where the water damage was becoming more and more apparent with cracks in the wood-wrapped arc. What wasn't apparent was the extent of the interior damage, which basically led to an entire reconstruction. We now have Azek material on the outer arc edge, wrapped in the ingenious way my carpenter heated the material to mold it into the arc. You can read more about that in last month's post (see above link). The other obvious issue (besides the fact that the balusters were not all positioned in a uniform way), was the view from the balcony itself, looking over the banister's edge. We had unsealed seams of cheap flashing that was caulked, both of which were the original contractor's stop-gaps to the initial design flaws. 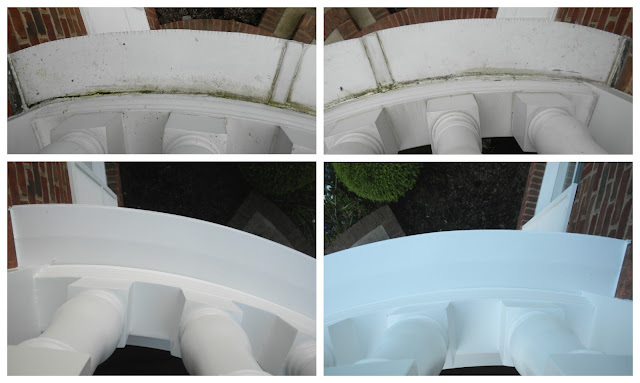 Those stop-gaps actually increased our problems, requiring useless maintenance of cleaning, re-caulking, which didn't even come close to keeping the balcony watertight. We now have a copper flashing cap over the entire balcony ledge, with seams welded in one, continous, 16' arc. 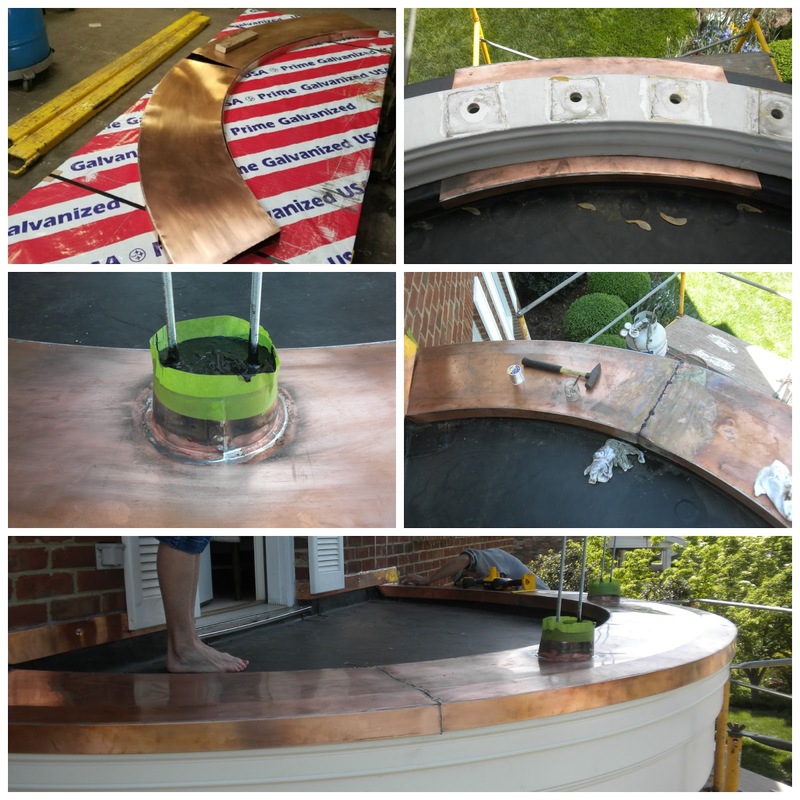 Once a mockup was made and the balcony 'curb' placed on top of the copper, the contractors fine-tuned measurement details, and the finished result was welded on site. The raised, circular pieces with steel rods and frog tape surrounding (in photo collage below) are where the balcony columns were ultimately secured. All of this was unsealed in the previous construction, with balcony columns and curb drilled directly onto the wood ledge. 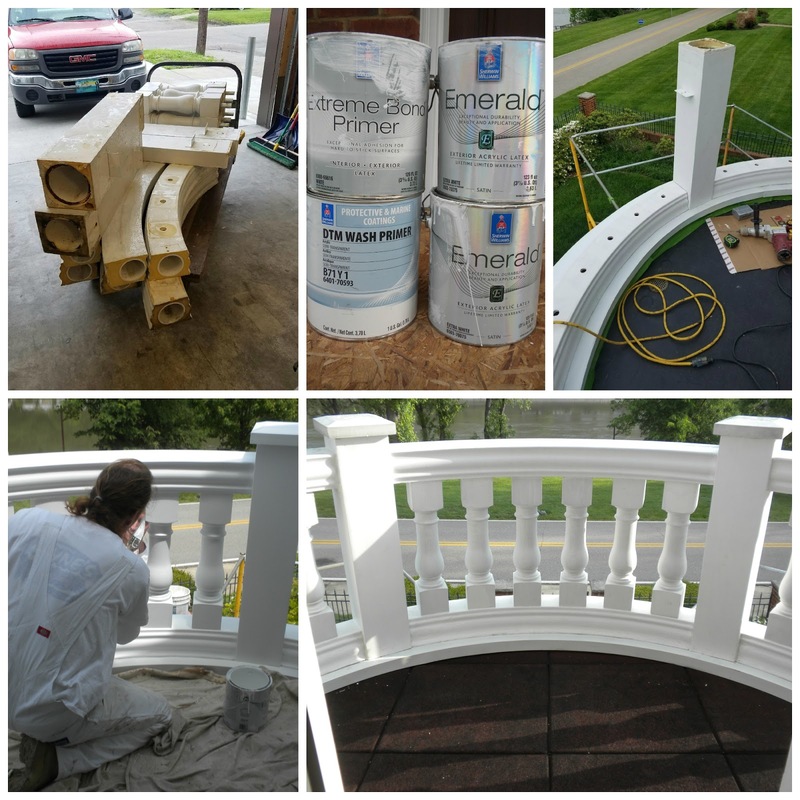 With the end close in sight, painting was the last big thing before the balcony could be reassembled. The weather did not cooperate, so my carpenter finally took the salvaged balcony pieces (from original construction) to his workshop to sand and prime. And yes, we opted to paint the copper ledge. We wanted a uniform appearance, and did not want to chance the patina process of the copper cap to run down over the Azek, so a special primer called DTM was used for the metal. Our carpenter replaced the interior roof pads (which were also salvaged from the original construction). Subcontracted professional painters knocked the painting out in about 4 hours one day after the sun finally came out. May 17, 2016: the scaffolding came down - in the rain - again. Lo and behold, just in time for the Memorial Day weekend, the queen appeared to accept her audience! To quote one of my neighbors as they greeted us one day shortly after the job completion, "Happy Portico!" (Thank you to Cindy of Dwellings: The Heart of Your Home, for featuring this on Amaze Me Monday #166 and to Kathryn and her readers at The Dedicated House, for making this a reader favorite and feature on The Sunday Showcase for Make It Pretty Monday)! 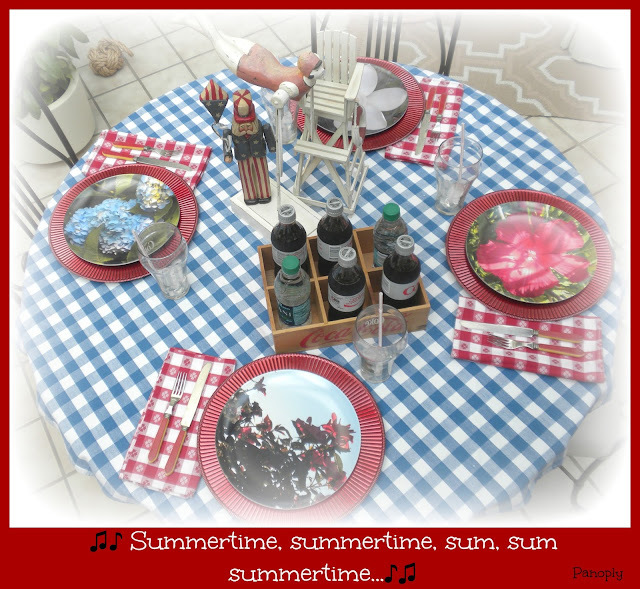 Summertime Tablescape: Livin' is Easy! Memorial Day marks the unofficial start to summer most everywhere in the U.S. It's a time for picnics, pools, reunions, memorials, parades, outdoor concerts, festivals, and just plain fun. The livin' is easy, porch sittin' is the means by which neighbors, family & friends have conversations that solve all the world's problems (well, at least our corners of the world), and we festively don our red, white & blue. 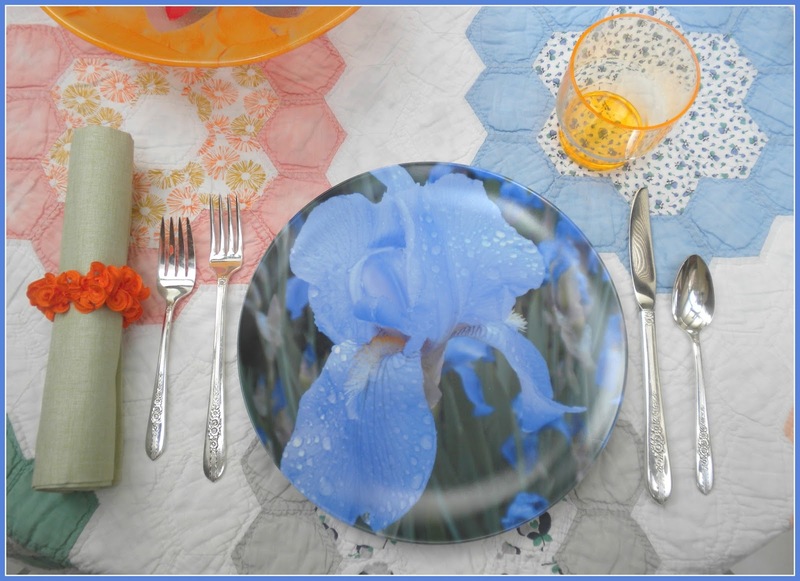 I pulled out the reds, whites, and blues for today's tablescape to celebrate summer's start. 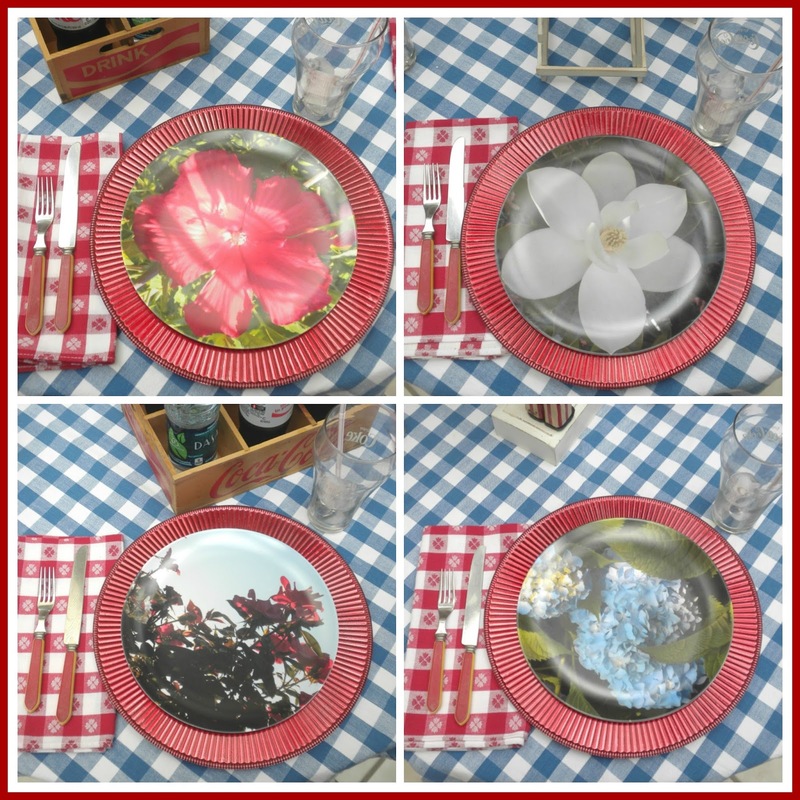 There are several specimens in my garden which represent the red, white and blue, and just like this tablescape and this one, too, I curated the plates used in this summertime tablescape starting with photographs I took of flowering trees, shrubs and perennial flowers in my landscape. 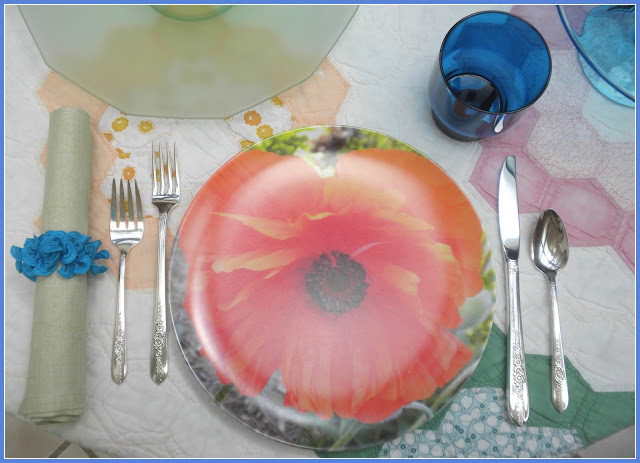 I designed and purchased the melamine plates on the Shutterfly website, which are perfect for use in summertime, when eating often takes place outdoors. and the (mostly) blue blooms of the 'Endless Summer' hydrangeas. 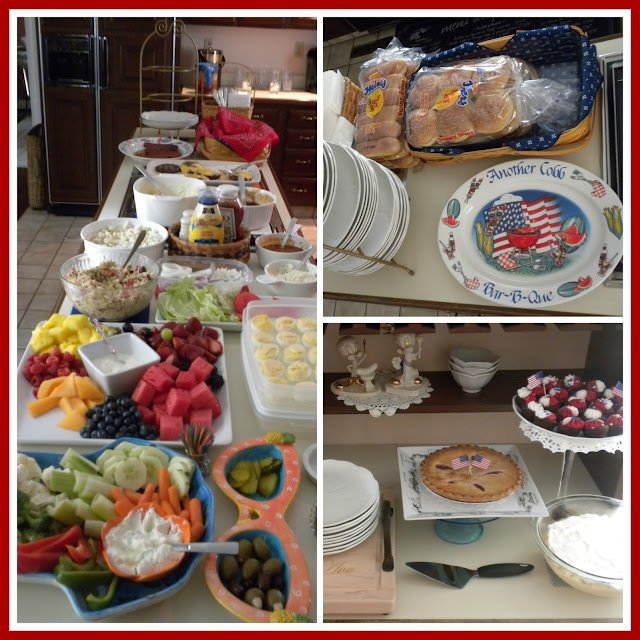 Food fare for summer occasions are simple burgers, hot dogs, and lots of fixins', usually set in a buffet style. Lots of soft drinks, water and iced tea are ready for thirst-quenchin', and desserts are at the ready, for grabbin' and goin'. 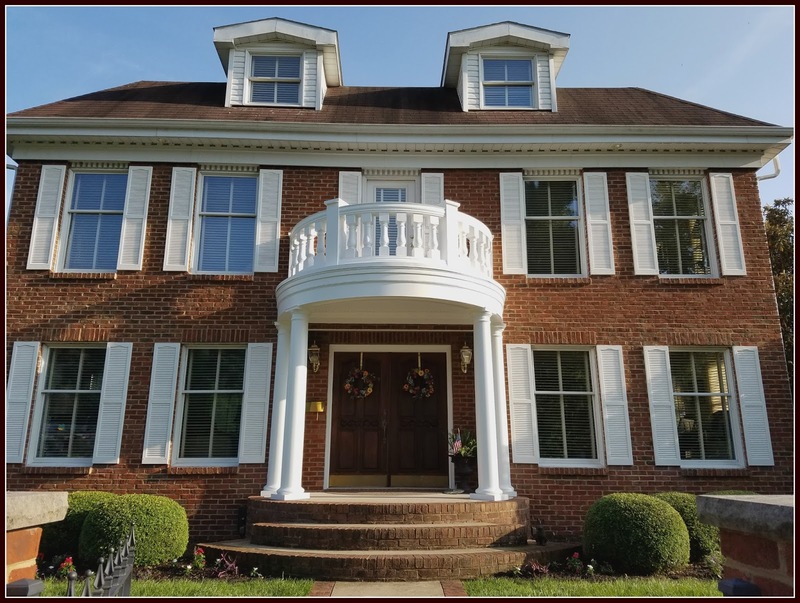 Typically a lunchtime fete, our family, anywhere from 6 to 26 gathered, are casually seated in various areas of our open floor plan of our home, anywhere from the breakfast area near the kitchen, to the sunroom adjacent to the outdoor courtyard. First come, first served is our method for not only being served, but being seated. It's a laid back kind of gathering (once the food prep is complete), a fun time of year! No matter how you celebrate summer, I hope it's a time where your lifestyle is more relaxed, your livin' is a little easier, and you're proud of our red, white and blue. If you display our flag, please do so with respect. You can read proper etiquette for American flag displaying here. Thanks for joining me in the garden and at the table today. Your readership is appreciated, and your comments are welcome. 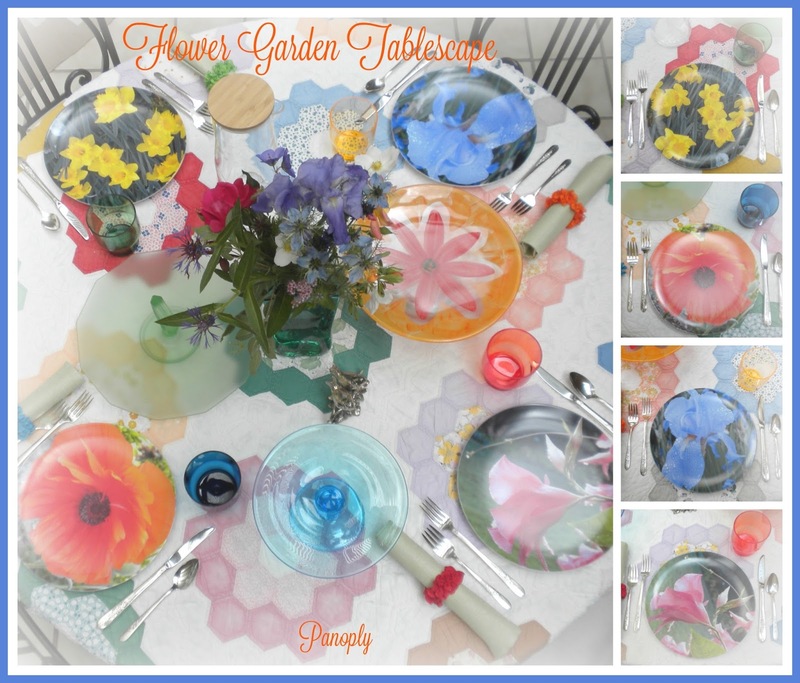 Today I invite you into the sunroom while sharing my latest tablescape, Grandmother's Flower Garden. Though not a grandmother myself, it is inspired by my own garden, of which many flowers within are pass alongs from women who certainly were grandmothers. 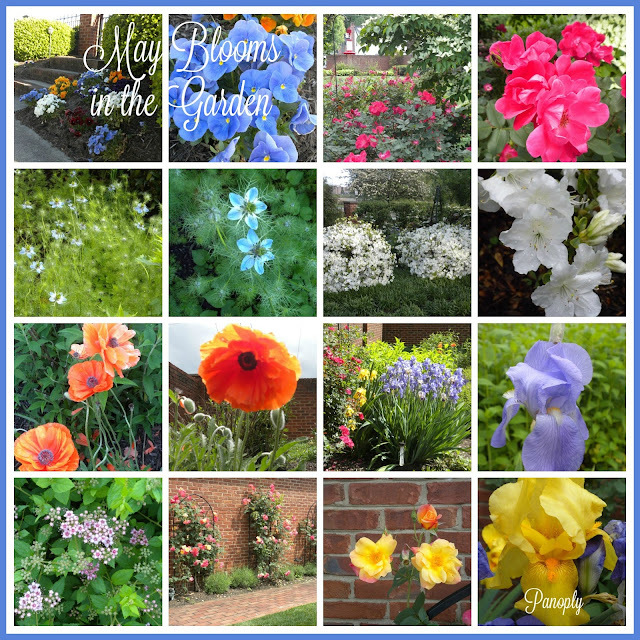 Just like my last post on my May garden, it is a profusion of blooms! 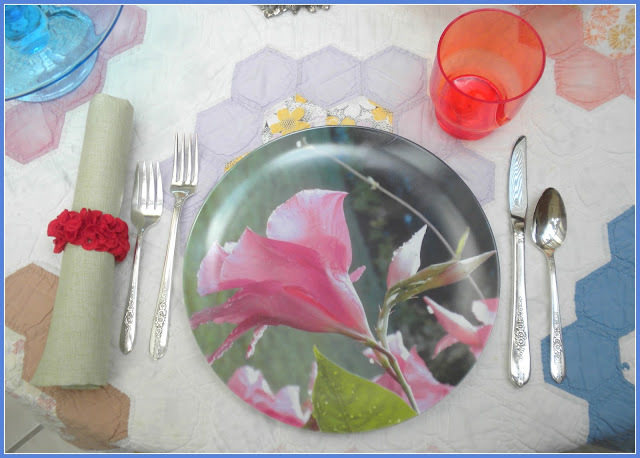 The plates I've used today are uniquely sourced from photographs I've previously taken of flowers in my garden, then designed and ordered through the Shutterfly website. They are melamine. The rest of the tablescape underpinnings are as follows: a vintage quilt in Grandmother's Flower Garden block pattern, along with vintage linen napkins; vintage 1939 silverplate utensils in 'Royal Rose' pattern, Marimekko for Target 5-piece acrylic carafe and stackable drinkware (remember the Finnish home line from the 1970s?? Well, it's baa-ack. ); and the napkin rings are none other than new and colorful, scrunchie hair ties! 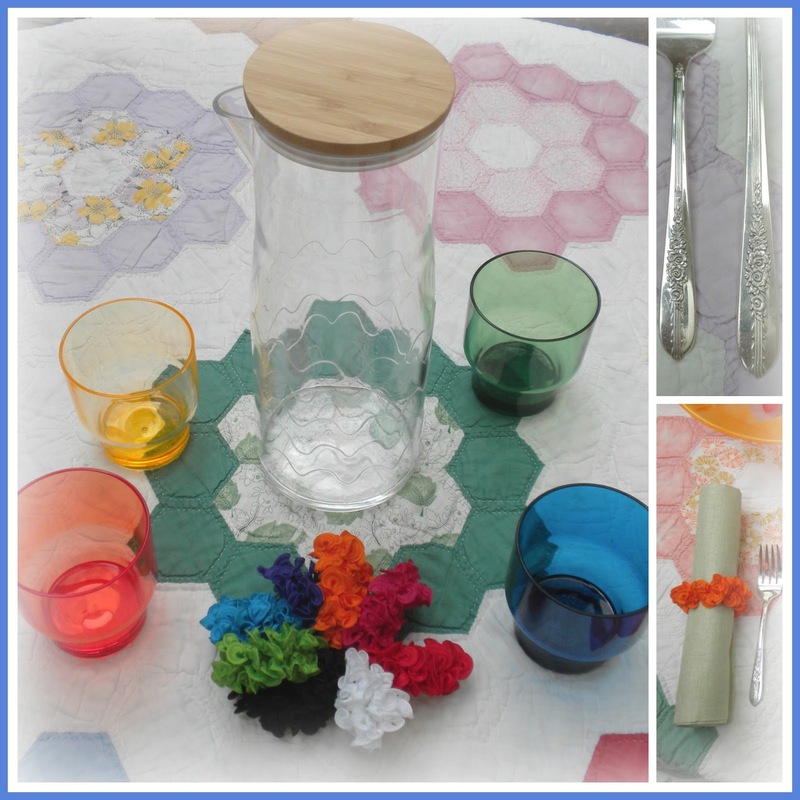 I added a few serving pieces of glassware to the table, along with my paper bag vase purchased recently from Blenko. The frosted green tidbit tray was my mother's, the small blue cake pedestal was a vintage purchase, and the orange and red cake pedestal was a wedding gift. 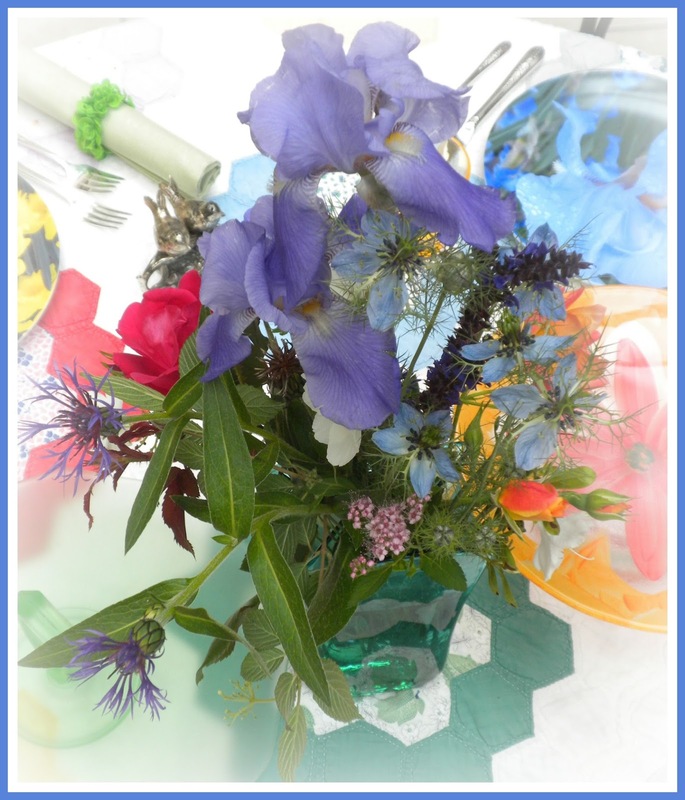 I took a walk in the garden and snipped a few blooms for the flower garden bouquet. 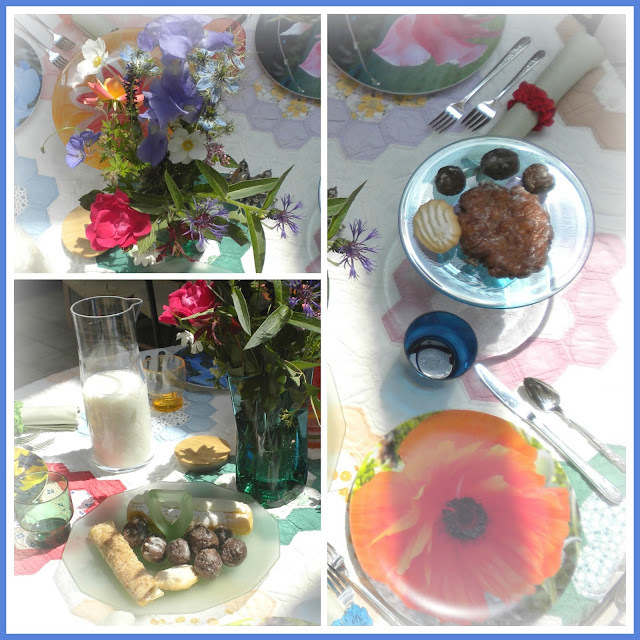 Since this is titled grandmother's flower garden tablescape, I imagined a food fare only a grandmother could let its guests get away with and make it appear healthy by how pretty it's presented: sweets and milk! Grandmother's Flower Garden Food Fare - Sweets! 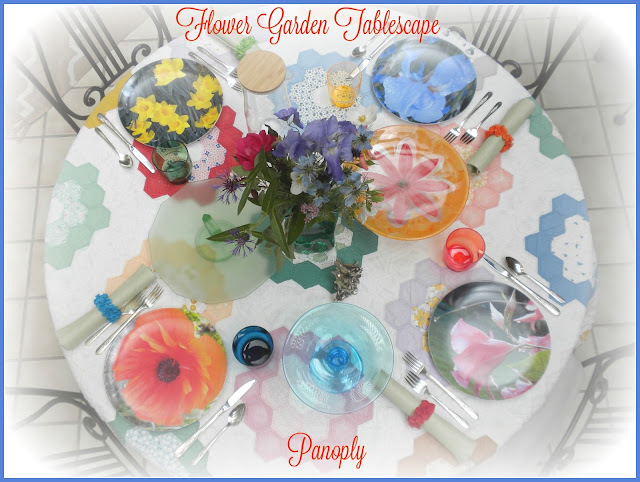 After this past week in the garden, the inspiration for this tablescape followed and flowed easily. 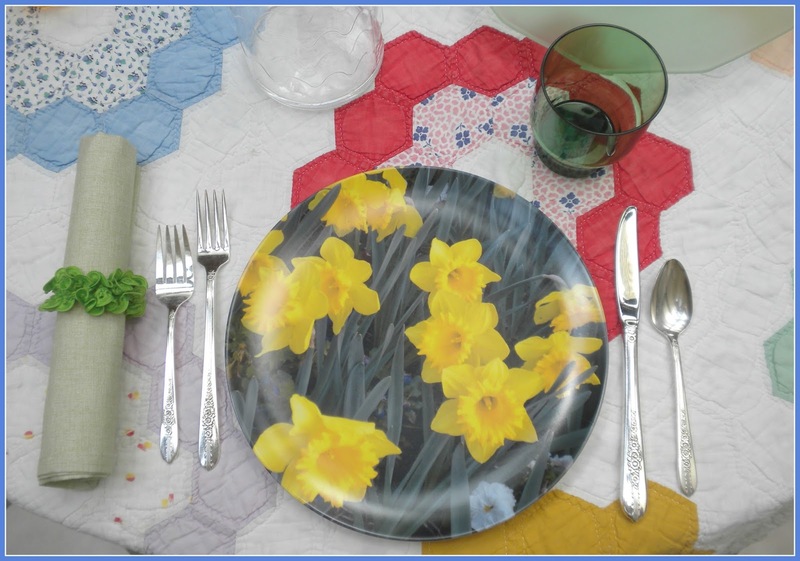 The Shutterfly option of creating my own plates first came to me last fall, after which I was inspired to create this tablescape. With this order, I was able to take a 50% discount right before Mother's Day, plus free shipping. I only used a portion of what I designed and purchased. :) Neither this or any other source mentioned in this post is sponsoring me. My blog is a non-revenue generating one. 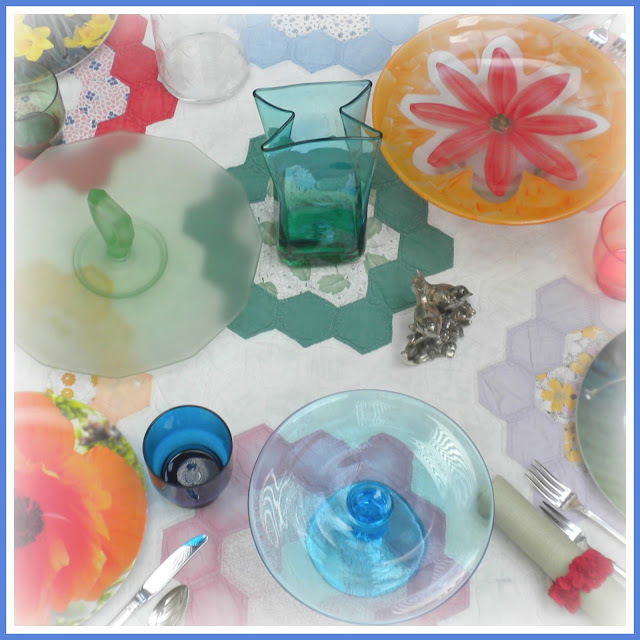 What a fun tablescape this was to put together! I hope you enjoyed it as much as I did assembling it. Having just returned from a week away, my focus at home quickly shifted to working in the garden and observing its many changes. It is a profusion of blooms right now! We've had nearly 7" of rain, spread over the last few weeks (according to my garden's rain gauge), and it's been very beneficial. The grass I patched in late March is now full, all my transplants are established, and new growth and blooms are pushing daily. My over-wintered pansies in the front of the house are still doing very well, mostly due to the fact that temperatures have remained mild - as you would expect for true, spring-like weather. Below: view of garden from back, southeastern corner. The photo below shows the front, northwestern corner of garden (as seen in the left corner of the above long shot), with azaleas, kousa dogwood in bloom. 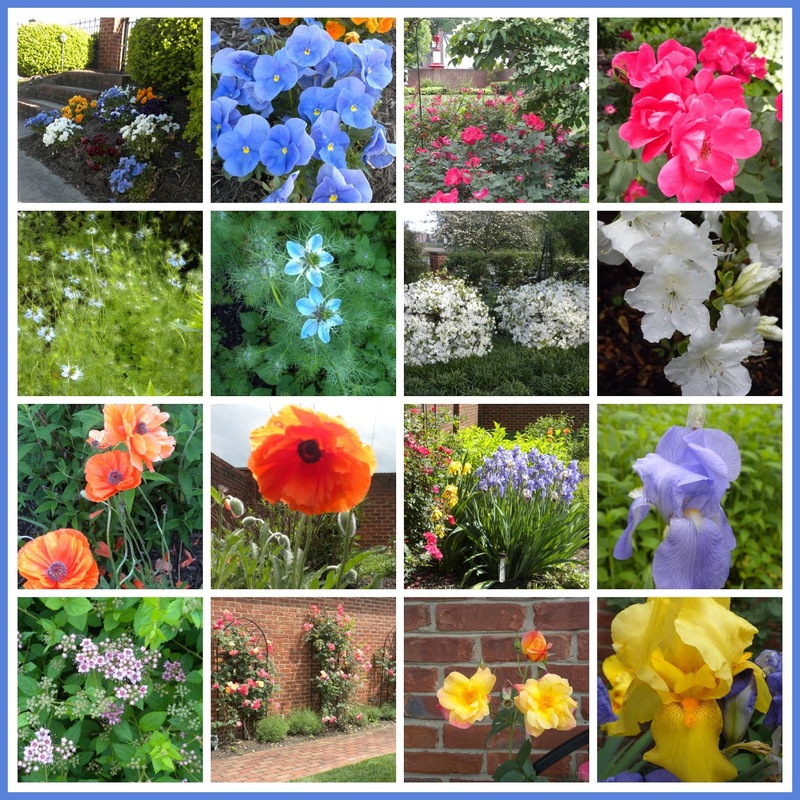 Front to back May blooms, east wall of garden: poppies, salvia, irises, and knockout roses trained to grow upward on trellises against wall. Knockout roses in front garden can be seen in background. Irises, as viewed from opposite direction of eastern garden wall. Spirea bushes, planted in the front of the eastern garden bed, (photo below), are just beginning to bloom. Black-eyed Susans will grow and fill in around the statue, while bee balm (left of statue and behind salvia) will bloom in red. Butterfly bushes are planted and can be seen to the right of photo frame, surrounding hummingbird feeder and poppies. This wall separates the courtyard from the main landscape (sunroom is visible beyond the wall). Courtyard climbing roses, against garage wall in courtyard. Lavender at base of courtyard roses are just starting to push blooms. I typically grow annual vines on my trellis which leads to/from the gate between the courtyard and main landscape garden. This year, I planted only two Mandevilla vines (at the front of the trellis), but am trying my hand at planting moonflower vine seeds at the back of the trellis, nearer the gate. 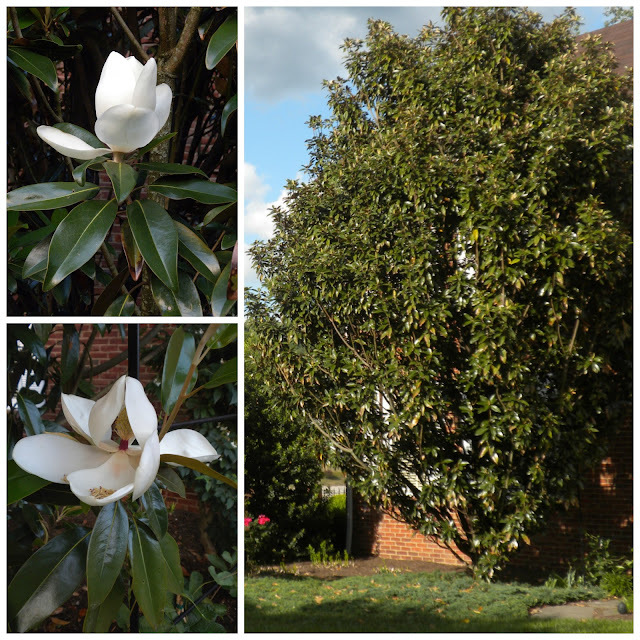 In the long view photo shown earlier in this post, the arch trellis is just behind the magnolia, where the eastern brick wall that separates the courtyard from main landscape starts. The photo below was taken from the courtyard gate opening, looking toward the landscape. Arch trellis from courtyard gate. Mandevilla vines are planted at landscape side, moonflower seeds planted at courtyard side (foreground). I've also planted a few other things besides the mandevilla vines and moonflower vine seeds - Texas bluebonnets (a gift from Sarah - thank you! ), Mexican sunflower (pass along seeds), and grocery store tulip centerpieces I purchased awhile back. The western wall of the landscape is less spring perennial blooms and more summer blooms (black-eyed Susans and sedum 'Autumn Joy'). Besides my salvia blooms and other landscape staple plants greening up (Otto Luykens, weeping cedar atlas), I wanted more color at this time of year, so I broke down and purchased five velvet ribbon dianthus to plant in between the salvia and sedum. Western wall landscape bed, with dianthus alternating with sedum and salvia in front of bed, black-eyed Susans against brick wall. Weeping cedar atlas drapes the wall. They're hard to see, as I just planted them this past Saturday, but here's a closeup (below). They should grow to be as much as 14" tall and wide, which will fill in the front border nicely in years to come. In the southwestern corner of the garden (just beyond the Otto Luykens shrubs), love-in-a-mist has spread freely among the other perennial plantings, Below, you can see their wispy stems with thistle-like flower heads, and a glimpse of my perennial hibiscus just now around 18" (bottom right). The hibiscus will grow to be over 7' feet by July, with lots of labor-intensive staking between now and then. Overall, the southernmost area of the garden is growing, and will be showy (fingers crossed) starting in June-July, with hibiscus, hydrangea, evening primrose, butterfly bushes, Mexican sunflower, and in August with hosta blooms. Southernmost section of garden (front to back of photo): Otto Luykens, hibiscus, love-in-a-mist, hostas, hydrangeas, butterfly bushes and evening primrose. 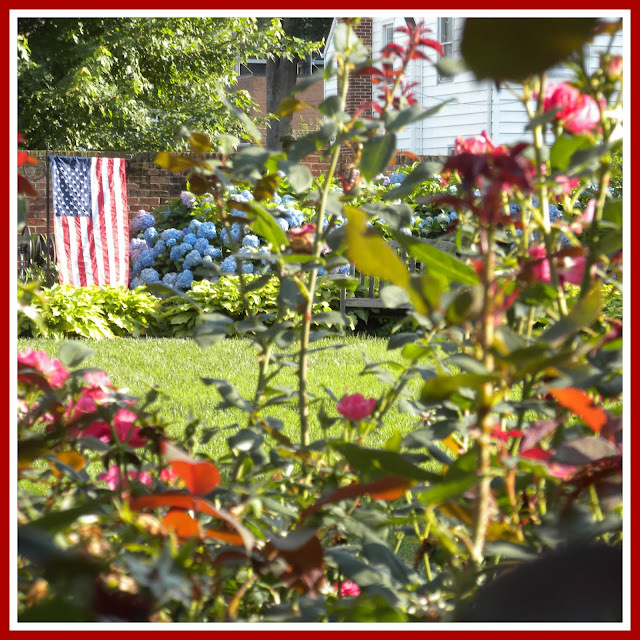 Mexican sunflower seeds are planted just beyond flag. Just before we left for our trip on May 4th, I placed two hummingbird feeders in the garden. Upon our return, both feeders were nearly empty, so I knew they had arrived. While walking the garden the morning of our return (the 11th), I caught my first sighting! The hummers are so energetic and seemingly nervous! The noise from adjusting my lens prompted this one to quickly move on the feeder, to where I was in sight. The next morning, after filling the feeders, I saw the male hummingbird. I really enjoy these birds more than any other I've had the pleasure of hosting. For more information on hummingbirds, a simple recipe for hummingbird feed, the ant moats I use, and predators to be aware of, be sure to see this post. Work in the garden continues. I hauled several bags of topsoil onto the riverbank, and I'm attempting to reseed grass where the boxelder tree was taken out. After I worked the soil, the shape looked like a sea turtle to me, so I snapped a photo. Riverbank lawn amendment - a sea turtle! I bought several large bags of potting soil for my containers, but I'm still deliberating what I'll plant, so no plant purchases have been made yet. 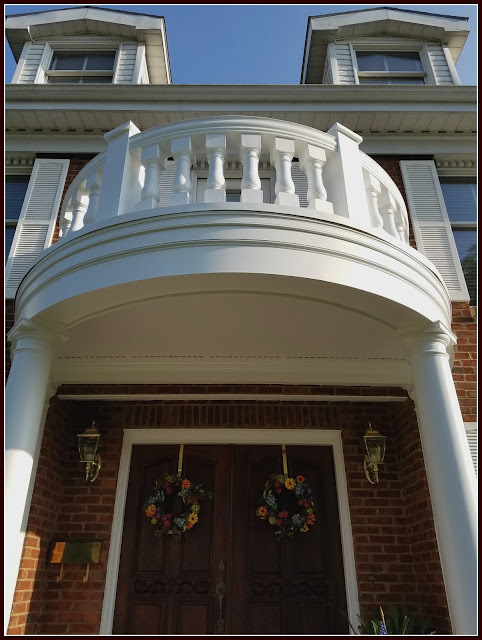 The balcony redo is finished, except for the painting (prime coat is on). Weather has extended this project's timeline to double its original projection. We're hoping this Monday it will be painted, and scaffolding removed. The photo below was taken from the balcony, looking to the northwestern corner of the landscape. As you can see in the bottom, righthand corner, the scaffolding is still in place. The queen will appear and wave to the crowds when the scaffolding is removed and summer annuals are planted in the beds below. Thank you for joining me on this May walk in the garden. I appreciate your readership, and your comments are always welcome. I hope you will join me later in the week when I share a unique tablescape, inspired by my garden blooms. 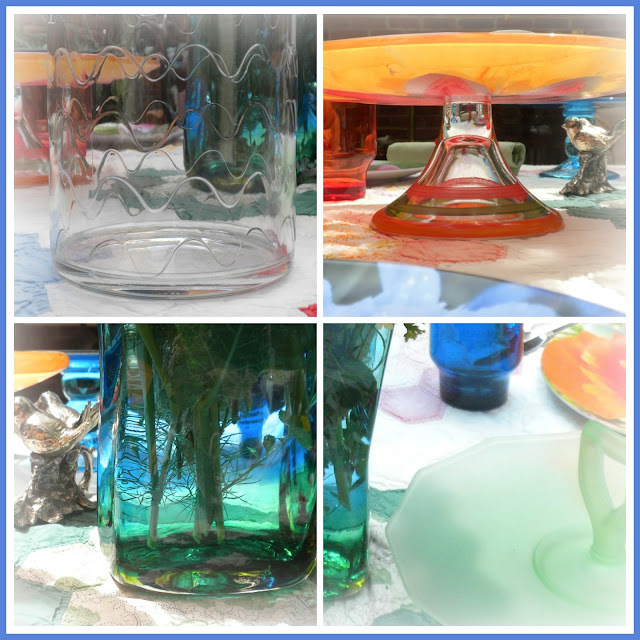 A special thanks to Kathy at Delightsome Life Home & Garden and Jann, Jo, and Carol at Share Your Cup for featuring this post! Click on Photo for Inspiration! Click on link for highlights! What Junk's in Your Trunk?? Click on graphic to see what's in ours!